Similarly, Peter Ryan facing the Police Integrity Commission for questions about his involvement in the demise of the dysfunctional reform unit. Chess in the court (rolling the legal system). Costa: The Bail Act holding people like Mr Pintos-Chaves charged with murder after voluntary DNA testing by police landed him in remand from December 2000 released on 30 January 2002. The DPP elected to discontinue the case due to unsubstantiated links in the evidence. Holding any person in jail for any term that is innocent of a crime is a crime within itself. Replacing the Community Protection Act 1994 now defeated by the High Court. Carr's attempt to reframe the CPAct breaking down the Bail Act. This new tool (breaking down the Bail Act) makes it easier to hold and incarcerate or convict a person. And can be used by authorities to punish the innocent the agitator or the whistleblower. Ms Rebecca Bernauer happened to be giving evidence about a corrupt cop in a drug case and dies at the hands of a flawed police investigation. Why would a person like Mr Pintos-Chaves volunteer his DNA if he were guilty? Clive Small, has now taken over as the hero of the day who gets let off with his Contempt of Parliament in the Cabramatta Parliamentary Inquiry. Now ends up in the parliament to advise on strategy and policy for Bob Carr the Premier as Assistant Commissioner of police? One could assume Bob Carr likes working with Clive Small? Or Bob Carr likes working with people who are corrupt? Or who act corruptly in the name of the political leader? 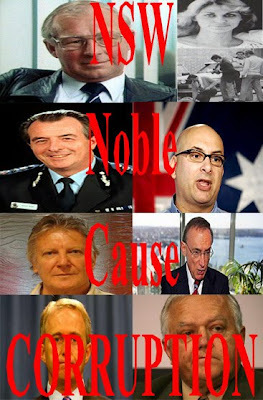 The Ombudsman Irene Moss reported the many flawed police investigations that in my opinion, is just the tip of the ice-burg in the discovery of the secret Carr Governments religious right wing movement that has been going on for many years to take care of the problems that interfere with its political agenda by stealth. Terry Falconer murdered in custody. Led away by police and found mutilated presenting grave fears for people who have to submit to arrest. David Phillip Pattison had sold his badge doesn't give anyone confidence either. Bikies working with Police wouldn't be the first time? Michael Costa's changes to the name of police from, Police Service to Police Force. Costa "it better reflects at tougher approach." If you can't account for the lost uniforms that can be used unofficially in some scam, you change the name and the uniform? In my case for instance police have lied in court after I was marginalised and excluded (hit with a stick) for providing information to my local MP Ms Clover Moore about police corruption. Moore, then took out an AVO against me, because Senior Police told her lies about my history (that I had a mental illness and was a drug addict who needed therapy. In fact when I made my complaint about being assaulted it was said 'I suffered paranoid delusions'. Subsequently I was taken to a mental health facility and injected with enough drugs as my solicitor Mr Angus Neil-Smith suggests that would "put down an elephant" for placing a poster on Clover's office in Paddington outlining police corruption. Corruption that continued even after I made my complaint about police corruption to Moore several times. In fact the stalking by police became more frenzied and fearsome in fact relentless even on Public Holidays the stalking became worse. I was released three days later by Magistrate Pearce. Mr Neil-Smith describes this as an illegal arrest by police and that says nothing about the Health Authorities. Subsequently I moved house three times to avoid the harassment by police. Again in front of Parliament House Sydney during a demonstration (Freedom Ride Amnesty for Drug War Prisoners) I was arrested and subsequently charged for a breach of the AVO Clover took out and resisting arrest even when I told Magistrate Stapleton "I was terrified when approached by police." She did not believe me but I can prove everything I say. Police gave evidence that I was shouting 'Clover Moore come out now' and 'he wanted his kids). Lies told by police in the court. Marginalised and excluded by the NSW Government when I asked for help. It is now my belief that the government profiles their victim's history and culture. For instance: If you're a heroin addict, Ray Denning, Peter Schneidas, HotShot. If you're a drug dealer, Lamfranchi, Huckstepp, shot by police and drowned by police. If you're a prostitute giving evidence about police, you're done over by your client. Just what people will believe? If you're' a drinker guess what 'you fell over in the lane' in this instant behind Petersham Pub. If you're a politician, Phuong Ngo, (John Newman MP), trying to stop drug gangs in Cabramatta (high profile case) that of the very fabric of Parliament, then the Asian gang got you. If you're Ivan Milat and you worked for the council travelling up and down the coast and you previously owned a gun you're the backpacker murderer. Especially if it is a (high profile case) and the government on this one was set to lose millions in tourism, if someone was not caught. Noble Cause Corruption? But if the police lied and set up Milat with the guns, as they do! That means the real murderer is still out there. Could be just as easy as bikies having their way with the tourists. People they trusted led them away backed up by corrupt police. If you're a protester, Tim Anderson you're the Hilton Bomber. If you're Gregory Kable, (high profile x prisoner) now released into the community, who had previously suffered diminished responsibility and a law was past specifically for you and you have now proved the government wrong. Police assault you with motorbikes, bikies militia, and friends of police and off duty police. I make a complaint but there is something wrong with my mind. Subsequently, wound up by police, including the Police Air Wing. I described to them that helicopters and motor bikes (bikie gang the Rebells) and (uniformed and unmarked police) were chasing me and the mental health authorities are told lies by senior police. Fantastic? Police in my view are the army that the NSW Government's stealth right wing employed to act contrary to the law in New South Wales, believe it or not? And you can start with Clive Small. In the Terry Falconer case he never got four minutes head start. Even in the fox hunt in England the fox got four minutes. These are grave fears for NSW prisoners indeed and for civilians alike, who are taken into custody at the will of the government for whatever reason. Personally I would reject any offer by police to handcuff me and lead me to the gallows to be mutilated, and so say all of us. The Government will and has blamed bikies in the Falconer case. I say the government has used an informer in my apartment block at Rushcutters Bay near the Cross to tip off Pol-Air when I was leaving my home. Once my position was located, Pol-Air would tell a gang of bikies what street I was in and send them to me. Behind the bikies who were sent to wind me up were marked police cars and paddy wagons. An isolated location was then sought and they would have shot me based on the flawed history on the cops computer describing me as a lunatic with no witnesses. The bikies ride high-powered Harley Davisons and Japanese motorcycles meant to scare any person in some instances the bikies went on to assault me trying to get me to react. Setting off car alarms as they roared down the street, usually off duty police. The common themes being no assistance from police, the duration of time of the harassment, 5 years. The amount of police involved, and the lack of investigation by authorities. PIC, Ombudsman, ICAC, HREOC. But police, politicians or any government official would not take any action or initiate any investigation or any forum in relation to my civil or democratic rights even to resolve the outstanding conflict of interest me getting assistance in and emergency by police. That means I have to solve it. How do you suppose I do that? I can prove the government in this state issued a directive in my case, a conspiracy if you like, that was detrimental to my health and well being and inconsistent with the law in this State. Directives are issued inside prison and outside prison to take care of the spoils, and we have to start solving the infamous crimes to solve and understand why there is a loss of innocent, young, vulnerable, helpless, and desperate people in the community. And the nominee's are: Bob Carr, Jeff Shaw, Paul Whelan, Peter Ryan, Clive Small, Ron Woodham John Klok and Carl Scully.. When inquires were made about Clive Small, Ron Woodham and John Klok the questions remained questions and are still questionable. Rolling the Legal System. Furthermore, the said nominee's stay at the top and try to stay together. What we could have is some answers? There are many people I could nominate as those who were taken away inside New South Wales Prisons.Those who were known to me and their story like Van Tran, a young man who was just married with a young baby. He was denied giving his DNA to the Crown to prove his innocents, when a person in the Police academy’s girl friend was killed, Tran was blamed. Subsequently, he was stabbed in prison and died before he attained the right to an appeal to have his DNA tested and introduced by the prosecutor or the defence. SKIPPY: People of the Lie.